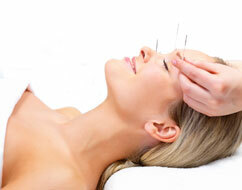 The practice of facial rejuvenation acupuncture has a long and rich history in traditional Chinese Medicine (TCM). Modalities utilising acupuncture, massage and dietary adjustments have been found to treat a wide range of skin conditions and promote health, longevity and beauty and to combat ageing. Thousands of years ago the Chinese discovered that many meridians either begin or end on the face while some have internal branches that go to the face. Thus, practitioners of Facial Rejuvenation Acupuncture know how to specifically affect the face while simultaneously treating the underlying factors that contribute to the aging process. Cosmetic Acupuncture is a healthy and natural substitute to plastic or cosmetic surgery. The insertion of very thin needles on the face enhances the blood circulation to the face and stimulate collagen production. Thus resulting into a healthy and glowing complexion. It is a rejuvenation and revitalisation process designed to help the whole body look and feel younger. Cosmetic Acupuncture provides good results at all stages of skin aging. body-mind continuum–the foundation of Holistic Medicine. Generally, it consists of 12 treatments. The effects become most noticeable and lasting on or about the seventh session. Each person responds differently, depending on his or her condition and lifestyle prior to treatment. Following the initial course of treatment, maintenance sessions can prolong the results for five to ten years. It is often recommended to supplement the Facial Rejuvenation program with Facial Self-Massage and/or Acupressure, Facial Exercises, Herbal and Nutritional Supplements, pure and authentic Aromatherapy blends for the skin, and a healthy diet. Many sources indicate that acupuncture has been used for almost 5,000 years to treat a wide range of conditions. Having proven itself with literally billions of people, Acupuncture has survived the test of time. the skin becoming delicate and fair, improvement of the elasticity of facial muscles and leveling of wrinkles, a ruddier complexion, and overall rejuvenation–not confined to the face. and dysfunction to continue within the body. Tracey Slater is a registered acupuncturist with the British Acupuncture Council, with training in the specialisation of Facial Rejuvenation Acupuncture, currently based in Dorking, Surrey.